1. Start NBA 2K18 and go to MyCAREER menu. 2. 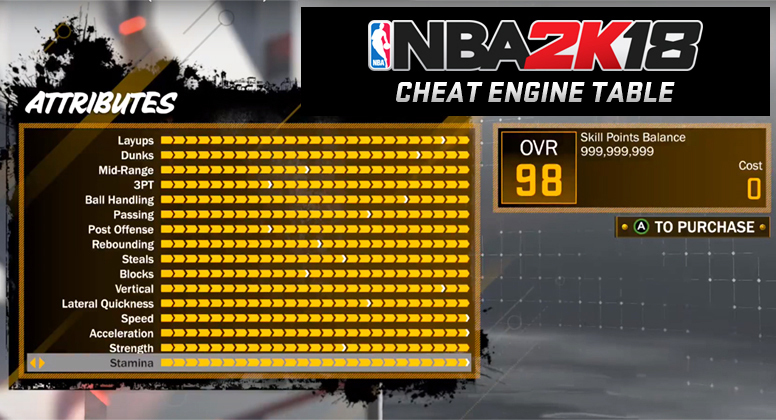 Open the cheat table, click the "select process" button and look for NBA2K18 from the applications list. Click Open. 3. Check the Max SP box to enable the script. 4. Go back to NBA 2K18 MyCareer menu and select "MyPLAYER Upgrades" and then "Upgrade Attributes". 5. Once you're in the "Upgrade Attributes" screen (where you see yellow bars and stuff), upgrade the layup attribute once and buy it for 100 Skill Points. 6. Now your Skill Points balanced should be 999,999,999. 7. Go back to Cheat Engine Table and check "Max out Skills". 8. While still being in the "Upgrade Attributes" screen, highlight all attributes by pressing down d-pad. 9. Now you should see that all attributes will be maxed out (full yellow bars) as you select them. Your overall rating will be 98 if you maxed out everything. Press A to purchase and select Yes. IMPORTANT: This table is only meant for offline use. I am not held responsible for your account or any account banned from using this CT on online modes. You have been warned.